Sunday, May 24 – Thursday, May 28, 1914: Nothing much doing. This is the fourth of five days that Grandma lumped together into one diary entry. Her infant niece, the daughter of her sister Besse, died on May 23. Yesterday’s post contained the death certificate for the baby. I was an aunt for one brief half a day yesterday, but didn’t know it until this morning. I was so disappointed when I heard it was dead. My little nephew was buried this afternoon. The baby I never saw. I feel like crying, when I think I am an aunt no longer. 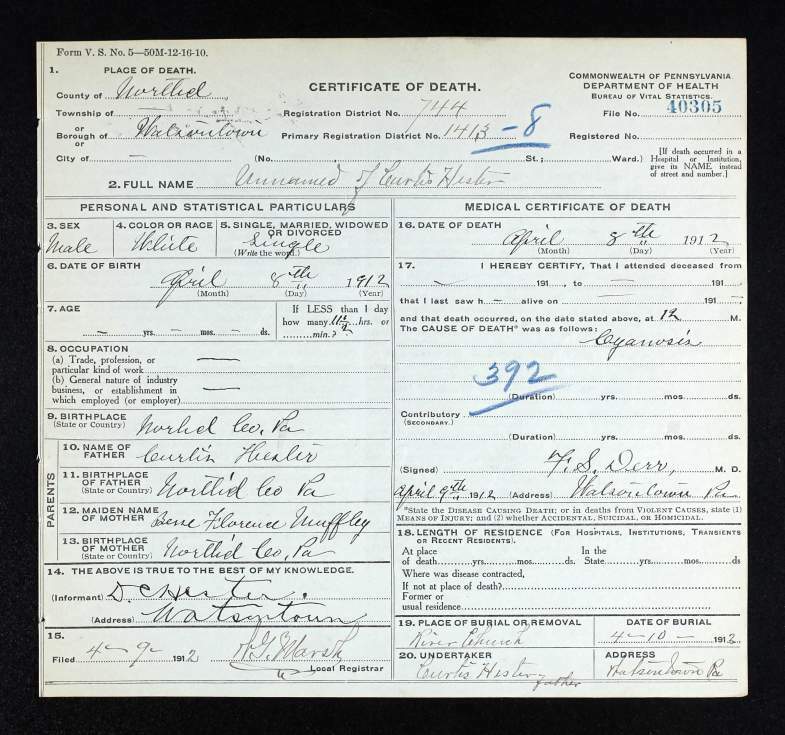 When Maryann Holloway saw yesterday’s post, she did a little research and found the death certificate of the baby who died in 1912. Thank you Maryann! I greatly appreciate you locating it—and then sharing it with me. Both babies died of cyanosis which refers to a bluish skin color. The babies may have been premature and had immature lungs, or perhaps a heart condition. The baby born in 1914 also had spina bifida. One thing that jumped out when I looked at the two death certificates was that the infants’ father, D. Curt Hester, signed them both. And, that his signature looked more wobbly in 1914 than in 1912. I can’t begin to imagine the stress and emotions that he was feeling when he signed those documents. The baby in 1914 lived 3 days before she died. At least to me, Curt’s signature in 1914 suggests, that he was exhausted and totally wiped out when he had to help complete the death certificate. Whew, what a sad task for a young father! I continue to be amazed at the help and kindness of my readers. One reader found the death certificate of the baby born in 1914—and then another found the death certificate of the one born in 1912. Thanks again, Maryann and Agnette. An aside– You might enjoy reading Maryann’s blog, If I Had a Time Machine. It contains interesting historical anecdotes for each day. Posted on May 27, 2014 October 2, 2016 by SherylPosted in GenealogyTagged family history, genealogy. Sheryl I agree the second signature looks far more shaky. We can only imagine at the terrible stress. I was glad to help and thanks for promoting my site. Both babies died of the same condition, so sad. I am just now reading the posts from the last few days and it must have been incredibly sad for the family. Those signatures are very poignant. Yes, there’s definitely a difference in the signatures. Oh, that poor man . . . The past few days after reading what you wrote I can understand why Helena did not feel like writing, such a heartache for the whole family and I can never know the pain poor Bessie and Curtis must have gone through. I am not sure if I read it but did they name the babies? I might have missed it. Sometimes I think about how much tragedy was a part of lives 100+ years ago…without medical help and just a more “difficult” life to live, being strong mentally such an important attribute. These signatures really makes one feel. Great post.